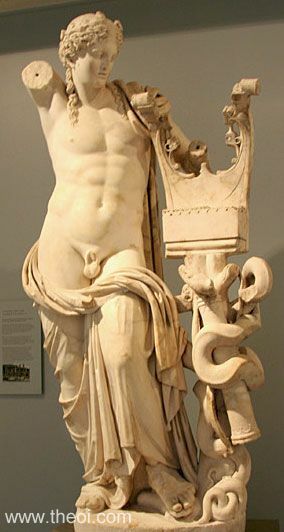 APOLLON was the Olympian god of prophecy, oracles, music, poetry, youth, healing, and protection from harm and plague. This page describes his cult in the Greek colonies of Asia Minor, Italy and beyond. His most important shrines in the area were undoubtedly the oracles of Didyma near Miletos and Klaros near Kolophon, and the curious temple of Apollon Smintheus in the Troad. "The city [of Adrasteia in the Troad] is situated between Priapos and Parion; and it has below it a plain that is named after it, in which there was an oracle of Apollon Aktaios (of the Shore) and Artemis ((lacuna)) . . But when the temple [of Apollon] was torn down, the whole of its furnishings and stonework were transported to Parion, where was built an altar the work of Hermokreon, very remarkable for its size and beauty; but the oracle was abolished like that at Zeleia [in the Troad]." "The plain of Thymbra . . . and the Thymbrios River [in the Troad], which flows through the plain and empties into the River Skamandros at the temple of Apollon Thymbraios." "In Khrysa [in the Troad] is also the temple of Apollon Smintheus; and the symbol which preserves the etymology of the name, I mean the mouse, lies beneath the foot of his image. These are the works of Skopas of Paros; and also the history, or myth, about the mice is associated with this place: When the Teukrians arrived from Krete (Kallinos the elegiac poet was the first to hand down an account of these people, and many have followed him), they had an oracle which bade them to ‘stay on the spot where the earth-born should attack them’; and, he says the attack took place round Hamaxitos, for by night a great multitude of field-mice swarmed out of the ground and ate up all the leather in their arms and equipment; and the Teukrians remained there; and it was they who gave its name to Mt. Ida, naming it after the mountain in Krete. Herakleides of Pontos says that the mice which swarmed round the temple were regarded as sacred, and that for this reason the image was designed with its foot upon the mouse." "Homer calls Thebe [in the Troad] the city of Eëtion . . . and he clearly indicates that also Khrysa, which had the temple of Apollon Smintheus, belonged to Eëtion, if it be true that Khryseïs was taken captive at Thebe, for he says, ‘We went into Thebe [which Strabo suggests included Khrysa], and laid it waste and brought hither all the spoil. And this they divided aright among themselves, but they chose out Khryseïs for the son of Atreus.’"
"In the territory of Adramyttion [in the Troad] lie also Khrysa and Killa. At any rate there is still today a place near Thebe called Killa, where is a temple of Apollon Killaios; and the Killaios River, which runs from Mt. Ida, flows past it . . . Daës of Kolonai says that the temple of Apollo Killaios was first founded in Kolonai by the Aiolians who sailed from Greece; it is also said that a temple of Apollon Killaios was established at Khrysa, though it is not clear whether he is the same as the Apollon Smintheus or distinct from him. Khrysa was a small town on the sea, with a harbor; and near by, above it, lies Thebe. Here too was the temple of the Apollon Smintheus; and here lived Khryseïs [i.e. mythical, the daughter of Khryses, a priest of Apollon, in the Iliad]. But the place is now utterly deserted; and the temple was transferred to the present Khrysa near Hamaxitos when the Kilikians were driven out, partly to Pamphylia and partly to Hamaxitos. Those who are less acquainted with ancient history say that it was at this Khrysa that Khryses and Khryseïs lived, and that Homer mentions this place; but, in the first place, there is no harbor here, and yet Homer says, ‘And when they had now arrived inside the deep harbor’; and, secondly, the temple is not on the sea, though Homer makes it on the sea; ‘and out from the seafaring ship stepped Khryseïs. Here then did Odysseus of many wiles lead to the altar, and place in the arms of her dear father’; neither is it near Thebe, though Homer makes it near; at any rate, he speaks of Khryseïs as having been taken captive there. Again, neither is there any place called Killa to be seen in the territory of the Alexandreians, nor any temple of Apollon Killaios; but the poet couples the two, ‘who dost stand over Khrysa and sacred Killa.’ But it is to be seen near by in the Plain of Thebe. And the voyage from the Kilikian Khrysa to the Naval Station [i.e. of the Greeks in the Trojan War] is about seven hundred stadia, approximately a day's voyage, such a distance, obviously, as that sailed by Odysseus; for immediately upon disembarking he offered the sacrifice to the god [Apollon], and since evening overtook him he remained on the spot and sailed away the next morning. But the distance from Hamaxitos is scarcely a third of that above mentioned, so that Odysseus could have completed the sacrifice and sailed back to the Naval Station on the same day. There is also a tomb of Killos in the neighborhood of the temple of Apollon Killaios, a great barrow. He is said to have been the charioteer of Pelops and to have ruled over this region [and presumably founded the shrine of Apollon Killaios]; and perhaps it was after him that Kilikia was named, or vice versa. Now the story of the Teukrians and the mice--whence the epithet Smintheus, since sminthi means ‘mice’--must be transferred to this place." "Those who live in Hamaxitos in the Troad worship a mouse, and that is why, according to them, they give the name of Sminthion to Apollon whom they worship, for the Aiolians and the people of the Troad still call a mouse sminthos . . . And in the temple of Smintheios tame mice are kept and fed at the public expense, and beneath the altar white mice have their nests, and by the tripod of Apollon there stands a mouse. And I have also heard the following mythical tale about this cult. Mice came in tends of thousands and cut off before they ripened the crops of the Aiolians and Trojans, rendering the harvest barren for the sowers. According the god at Delphoi said when they enquired of him, that they must sacrifice to Apollon Smintheios; they obeyed and freed themselves from the conspiracy of mice, and their wheat attained the normal harvest. And they add the following story. Some Kretans who owing to a disaster that befell them were sent out to found a colony, besought the Pythion to tell them of some good place where it would be advantageous to found a city. There issued from the oracle this answer: in the place where the earth-born made war upon them, there they should settle and raise a city. So they came to this place Hamaxitos and pitched their camp to rest; but a countless swarm of mice crept stealthily upon them, gnawed through their shield-straps and ate through their bow-strings. So they guessed that these were the ‘earth-born’ referred to, and, besides, having now no means of getting weapons for defence, they settled in this spot and built a temple to Apollon Smintheios." "[In the Troad are the towns of] Chrysa and Larisa : the temple of [Apollon] Zmintheus still stands." "The Pergamenes [of Pergamon, Teuthrania] have a bronze Apollon made by Onatas, a most wonderful marvel both for its size and workmanship. This man livedabout two generations after the Persian invasion of Greece." "Reports were also current about him [Apollonios of Tyana] which originated from the various Oracles; thus from the Oracle at Kolophon it was announced that he shared its peculiar wisdom and was absolutely wise, and so forth; from that of Didyma similar rumours emanated, as also from the shrine at Pergamon." "[The historical Persian general] Kyros, assisted by Amorges, marched against Kroisos and the city of Sardes . . . After the city was taken Kroisos fled for refuge to the temple of Apollon." "On the Elaïtic Gulf [in Aiolia] . . . one comes to the Harbor of the Akhaians, where are the altars of the twelve gods; and then to a town Gryneion and an altar of Apollon and an ancient oracle and a costly shrine of white marble." "You may see linen breastplates dedicated in other sanctuaries, notably in that at Gryneion [in Aiolia, Asia Minor], where there is a most beautiful grove of Apollon, with cultivated trees, and all those which, although they bear no fruit, are pleasing to smell or look upon." "When the latter [Apollon] found that men no longer flocked to Gryneion for the sake of oracles nor to Klaros nor to Delphoi where is the tripod of Apollon, and that Orpheus was the only oracle, his head having lately come from Thrake, he presented himself before the giver of oracles and said : ‘Cease to meddle with my affairs, for I have already put up long enough with your vaticinations.’"
"The customary mode of divination here [at the altar of Apollon Spodios, in Thebes, Boiotia] is from voices, which is used by the Smyrnaians, to my knowledge, more than by any other Greeks. For at Smyrna also there is a sanctuary of Kledones (Voices) outside the wall and beyond the city." "Klazomenai [in Lydia] . . . [and beyond it] a temple of Apollon and hot springs, and the gulf and the city of the Smyrnaians." "Kolophon, an Ionian city, and the sacred precinct of Apollo Klarios, where there was once an ancient oracle. The story is told that Kalkhas the prophet, with Amphilokhos the son of Amphiaräus, went there on foot on his return from Troy, and that having met near Klaros a prophet superior to himself, Mopsos, the son of Manto, the daughter of Teiresias, he died of grief." "The land of the Ionians has the finest possible climate, and sanctuaries such as are to be found nowhere else. First because of its size and wealth is that of the goddess Ephesia [Artemis], and then come two unfinished sanctuaries of Apollon, the one in Brankhidai, in Milesian territory, and the one at Klaros in the land of the Kolophonians. Besides these, two temples in Ionia were burnt down by the Persians, the one of Hera in Samos and that of Athena at Phokaia. Damaged though they are by fire, I found them a wonder . . . In the land of Kolophon is the grove of Apollon Meliai (of ash-trees), and not far from the grove is the river Ales, the coldest river in Ionia." "Particularly in Klaros do the inhabitants and all Greeks pay honour to [Apollon] the son of Zeus and Leto. And so the land there is untrodden by poisonous creatures and is also highly obnoxious to them. The god wills it so, and the creatures in nay case dread him, sine the god can not only save life but is also the begetter of Asklepios, man's saviour and champion against diseases. Moreover Nakandros also bears witness to what I say, and his words are : ‘No viper, nor harmful spiders, nor deep-wounding scorpion dwell in the groves of Klaros, for Apollon veiled its deep grotto with ash-trees and purged its grassy floor of noxious creatures.’"
"Reports were also current about him [Apollonios of Tyana] which originated from the various Oracles; thus from the Oracle at Kolophon [Klaros] it was announced that he shared its peculiar wisdom and was absolutely wise, and so forth." "After leaving Ephesus . . . [one comes to] Colophon lying more inland, on the river Halesus. Then the temple of Clarian Apollo." "Larisa is a village in the territory of Ephesos [in Lydia] in the Kaystros Plain [in Teuthrania]; it is said to have been a city in earlier times, containing a temple of Apollon Larisaios and being situated closer to Mt. Tmolos than to Ephesos." "On the same coast [near the city of Ephesos], slightly above the sea, is also Ortygia, which is a magnificent grove of all kinds of trees, of the cypress most of all. It is traversed by the Kenkhrios River, where Leto is said to have bathed herself after her travail. For here is the mythical scene of the birth [of Apollon and Artemis], and of the nurse Ortygia, and of the holy place where the birth took place, and of the olive tree near by, where the goddess is said first to have taken a rest after she was relieved from her travail. Above the grove lies Mt. Solmissos, where, it is said, the Kouretes stationed themselves, and with the din of their arms frightened Hera out of her wits when she was jealously spying on Leto, and when they helped Leto to conceal from Hera the birth of her children. There are several temples in the place, some ancient and others built in later times; and in the ancient temples are many ancient wooden images, but in those of later times there are works of Skopas; for example, Leto holding a sceptre and Ortygia standing beside her with a child in each arm. A general festival is held there annually; and by a certain custom the youths vie for honor, particularly in the splendor of their banquets there. At that time, also, a special college of the Kouretes holds symposiums and performs certain mystic sacrifices." "Marsyas the flutist, the one who was flayed, was born during a festival of Apollon [probably held on Mt Tmolos in Lydia], where the skins of all those victims one has flayed are offered to the god." "Just as the Dorians of what is now the country of the ‘Five Cities’--formerly the country of the 'Six Cities'--forbid admitting any of the neighboring Dorians to the Triopion [i.e. the temple of Apollon Triopios in Triopion, a headland of Karia], and even barred from using it those of their own group who had broken the temple law. For long ago, in the games in honor of Apollon Triopios, they offered certain bronze tripods to the victors; and those who won these were not to carry them away from the temple but dedicate them there to the god. Now when a man of Halikarnassos called Agasikles won, he disregarded this law, and, carrying the tripod away, nailed it to the wall of his own house. For this offense the five city-states--Lindos, Ialysos, Kamiros, Kos, and Knidos--forbade the sixth city--Halikarnassos--to share in the use of the temple. Such was the penalty imposed on the Halikarnassians." "[The historical Lydian king Kroisos, fearing the Persian advance] made inquiries of the Greek and Libyan oracles, sending messengers separately to Delphoi [and various other oracles] . . . and others to Brankhidai in the Milesian country [oracle of Apollon]." "There are many offerings of [the historic Lydian king] Kroisos in Hellas . . . the offerings of Kroisos at [the shrine of Apollon at] Brankhidai of the Milesians, as I learn by inquiry, are equal in weight and like those at Delphoi . . . [these offerings] came from the estate of an enemy who had headed a faction against Kroisos before he became king, and conspired to win the throne of Lydia for Pantaleon." "Nekos [an historic Egyptian King] with his land army met and defeated the Syrians at Magdolos, taking the great Syrian city of Kadytis after the battle. He sent to Brankhidai of Miletos and dedicated there to Apollon the garments in which he won these victories." "The temple of Apollon at Didymoi." "Lyrkos [mythical king of Kaunos in Karia] and his wife had no children: and accordingly he made a journey to the oracle at Didyma, to ask how he might obtain offspring; and the answer was , that he would beget a child upon the first woman with whom he should have to do after leaving the shrine." "Brankhos [first of the Brankhidai priests], who presided over the temple [of Apollon] at Didyma, is called a descendant of Makhaireus [the man who slew Neoptolemos when he threatened the Delphic oracle]." "Next after the Poseidion of the Milesians, eighteen stadia inland, is the oracle of Apollon Didymeus among the Brankhidai. It was set on fire by Xerxes, as were also the other temples, except that at Ephesos. The Brankhidai gave over the treasures of the god to the Persian king, and accompanied him in his flight in order to escape punishment for the robbing and the betrayal of the temple. But later the Milesians erected the largest temple in the world, though on account of its size it remained without a roof. At any rate, the circuit of the sacred enclosure holds a village settlement; and there is a magnificent sacred grove both inside and outside the enclosure; and other sacred enclosures contain the oracle and the shrines. Here is laid the scene of the myth of Brankhos and the love of Apollon. The temple is adorned with costliest offerings consisting of early works of art. Thence to the city is no long journey, by land or by sea." "Both Milesians [at Didyma] and Delians invoke an Apollo Oulios, that is, as god of ‘health and healing,’ for the verb oulein means ‘to be healthy’; whence the noun oule and the salutation, ‘Both health and great joy to thee’; for Apollon is the god of healing." "I am persuaded that Seleukos [a general of Alexandros the Great] was the most righteous, and in particular the most religious of the kings. Firstly, it was Seleukos who sent back to Brankhidai for the Milesians the bronze Apollon that had been carried by Xerxes to Ekbatana in Persia." "The Sikyonian Kanakhos, who also fashioned the Apollon at Didyma of the Milesians, and the Apollon Ismenios for the Thebans." "The sanctuary of Apollon at Didyma [near Miletos, in Karia], and his oracle, are earlier than the immigration of the Ionians." "The land of the Ionians has the finest possible climate, and sanctuaries such as are to be found nowhere else. First because of its size and wealth is that of the goddess Ephesia [Artemis], and then come two unfinished sanctuaries of Apollon, the one in Brankhidai, in Milesian territory, and the one at Klaros in the land of the Kolophonians. Besides these, two temples in Ionia were burnt down by the Persians, the one of Hera in Samos and that of Athena at Phokaia. Damaged though they are by fire, I found them a wonder." "Xerxes, too, the son of Dareius, the king of Persia, apart from the spoil he carried away from the city of Athens . . . [after] accusing the Milesians of cowardice in a naval engagement against the Athenians in Greek waters, carried away from them the bronze Apollon at Brankhidai. This it was to be the lot of [the Persian general] Seleukos afterwards to restore to the Milesians." "The image [of Apollon Ismenios at Thebes, Boiotia] is in size equal to that at Brankhidai [near Miletos, in Asia Minor] ; and does not differ from it at all in shape. Whoever has seen one of these two images, and learnt who was the artist, does not need much skill to discern, when he looks at the other, that it is a work of Kanakhos. The only difference is that the image at Brankhidai is of bronze, while the Ismenios is of cedar-wood." "Apollon Didymois (of Didyma) must be sufficient to guarantee to every man of sound mind and strong intelligence. At any rate he [the oracle] says that the Triton is a creature of the sea, and his words are : ‘A child of Poseidon, portent of the waters, a clear-voiced Triton, encountered as he swam the rush of a hollow vessel.’"
"The men of Miletus made an expedition against the Naxians [historical] . . .
[During the course of the campaign] came the Milesians' celebration of the Thargelia [i.e. an Ionian festival of Apollon and Artemis held in early summer]--a time when they indulge in a deal of strong wine and make merry with very little regard to the cost." "There is also near Magnesia [in Ionia] on the river Lethaios a place called Aulai (Halls), where there is a cave sacred to Apollon, not very remarkable for its size, but the image of Apollon is very old indeed, and bestows strength equal to any task. The men sacred to the god leap down from sheer precipices and high rocks, and uprooting trees of exceeding height walk with their burdens down the narrowest of paths." "Close to Kyaneai by Lykia, where there is an oracle of Apollon Thyrxeus, the water shows to him who looks into the spring all the things that he wants to behold." "After Xanthos [in Lykia], is Patara which is a large city, has a harbor, has a temple of Apollon." "The Lykians in Patara show a bronze bowl in their temple of Apollon, saying that Telephos [a hero of the Trojan War] dedicated it and Hephaistos made it." "There is a bay at Myra in Lykia and it has a spring and there is a shrine of Apollon there, and the priest of this god scatters the flesh of calves that have been sacrificed to the god, and sea-perch come swimming up in shoals and eat the flesh, as though they were guests invited to the feast. And the sacrificers are delighted, for they believe that this feasting of fishes is a good omen for them, and they say that the god is propitious because the fish gorged themselves on the flesh. If however the fish cast the food ashore with their tails as though they despised it and regarded it as tainted, this is believed to signify the wrath of the god. And the fish recognise the priest's voice, and if they obey his summons they gladded those on whose behalf they have been summoned; in the opposite even they cause them grief." "Themisonion above Laodikeia is also inhabited by Phrygians. When the army of the Gauls was laying waste Ionia and the borders of Ionia, the Themisonians say that they were helped by Herakles, Apollon and Hermes, who revealed to their magistrates in dreams a cave, and commanded that in it should be hidden the Themisonians with their wives and children. This is the reason why in front of the cave they have set up small images, called Gods of the Cave, of Herakles, Hermes and Apollon. The cave is some thirty stades distant from the city, and in it are springs of water. There is no entrance to it, the sunlight does not reach very far, and the greater part of the roof lies quite close to the floor." "A city Kyrion [in Kypros] . . . One may therefore see at once the carelessness of the poet who wrote the elegy that begins, ‘we hinds [deer], sacred to Phoibos, racing across many billows, came hither in our swift course to escape the arrows of our pursuers,’ . . .
Kyrion is the beginning of the westerly voyage in the direction of Rhodes; and immediately one comes to a promontory [in Kypros], whence are flung those who touch the altar of Apollon." "On Kourias [in Kypros] when the Deer (of which there are a great number and many hunters keen in pursuit of them) take refuge in the temple of Apollon there (the precinct is of very wide extent), the hounds bay at them but do not dare to approach. But the Deer in a body graze undeterred and without fear and by some mysterious instinct trust to the god for their safety." "After the death of Adonis, Aphrodite, it is said, wandered around searching for this [i.e. a cure for love]. She found it in Argos, a town of Kypros, in the sanctuary of Apollon Erithios and l'emporta after having told Apollon in confidence the secret of her love for Adonis [i.e. the god told her how to remedy her broken heart at his shrine at Leukas in Greece]." "[The historic Egyptian king] Amasis became a philhellene (Greek lover), and besides other services which he did for some of the Greeks, he gave those who came to Aigyptos (Egypt) the city of Naukratis to live in; and to those who travelled to the country without wanting to settle there, he gave lands where they might set up altars and make holy places for their gods . . . The Aiginetans made a precinct of their own [in Naukratis], sacred to Zeus; and so did the Samians for Hera and the Milesians for Apollon." "Dionysios [tyrant of Syrakousa, ca. 430-367 B.C.] stole objects from all the temples of Syrakousa. From the cult statue of Zeus he removed the clothing and other ornaments . . . He despoiled the statue of Apollon as well." "At the present time a sacred contest [of Apollon?] is celebrated among them [the people of Neapolis (Naples) in Italia], in music as well as gymnastics; it lasts for several days, and vies with the most famous of those celebrated in Greece." "The people of Kyme (Cumae) among the Opikoi say that the [Kalydonian] boar's tusks dedicated in their sanctuary of Apollon are those of the Erymanthian boar, but the saying is altogether improbable." "Dionysios [tyrant of Syrakousa, ca. 430-367 B.C.] stole objects from the temples . . . he sailed to Tyrrhenia [Etruria] and stole all the property of Apollon and Leukothea, instructing his men to drink a toast to the Benevolent Deity (daimon agathos) as they removed a silver table that stood next to the statue of Apollon." "There are a few families in the Faliscan territory [in Etruria, central Italy], not far from the city of Rome, named the Hirpi, which at the yearly sacrifice to Apollo performed on Mount Soracte walk over a charred pile of logs without being scorched, and who consequently enjoy exemption under a perpetual decree of the senate from military service and all other burdens." "Massilia [in Gaul] was founded by the [Greek] Phokaians, and it is situated on a rocky place. Its haroubr lies at the foot of a theatre-like rock which faces south . . . It is on the headland that the Ephesion and also a temple of Apollon Delphinios (of the Dolphins) are situated. The latter is shared in common by all Ionians." Ctesias, Persica - Greek History C5th B.C. Callimachus, Fragments - Greek Poetry C3rd B.C. Parthenius, Love Romances - Greek Mythography C1st B.C. Aelian, Historical Miscellany - Greek Rhetoric C2nd - 3rd A.D.
Ptolemy Hephaestion, New History - Greek Mythography C1st - 2nd A.D.
Pliny the Elder, Natural History - Latin Encyclopedia C1st A.D.
Seneca, Troades - Latin Tragedy C1st A.D.
Photius, Myriobiblon - Byzantine Greek Scholar C9th A.D.